Wales won what was a battle of breakdown wit, leaving not much room for flair. Key to Wales’ dominance was the presence of Justin Tipuric. Seemingly all over the pitch, he was constantly creating opportunities, and it was only fair that he scored his side’s only try, and fairer still he was awarded the Man of the Match. When trying to analyse the details of the match, it was only too clear, more than half of the talking points are Tipuric himself. So let’s try and see the finer details of his impact on the game. Even without the ball, Tipuric was subtly making the game easier for his team mates. It’s hard to see below, but if you keep an eye on the blue scrum cap you’ll see how he made all the difference. In the wide shot you can see Tipuric covers his opposite number, Murphy, well. But it’s not cover. Once he’s got Murphy well chased, and convinced of the direction of play, he moves in behind him. That creates the space for Scott Williams to run through. Once Murphy realizes what’s happening, the center is well shielded by Tipuric. A cunning move that is the exact kind of borderline legality a team needs from their flankers. While not as much of a game changer as the first example, here’s Tipuric just being in the right place at the right time. 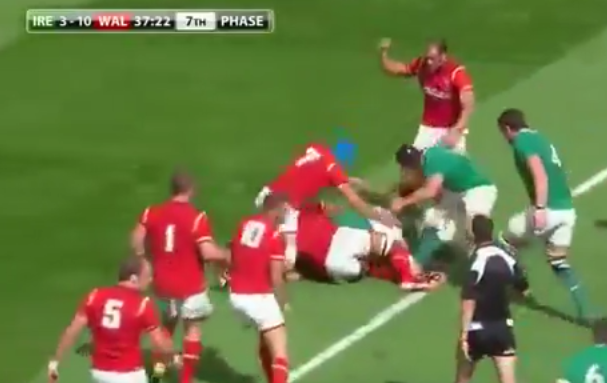 Tipuric is on Biggar’s shoulder to pick up, and being the threat that he is, draws the attention of two Irish defenders. Knowing that at this late stage in the game he’s a well marked man he quickly ships the ball out to Roberts, sending him on a great run. Not only that, but Tipuric is on his shoulder the entire time, ensuring a clean recycle clean once Roberts is inevitably put to ground. Tipuric continued to show his immaculate sense of positioning with this well timed charge down. Tipuric defined what it is to be a workhorse in not only making the charge down, but following it up, getting on the ball before Sexton and presenting it cleanly back to his team mates. Turnover of possession, and 20 yards gained to boot. 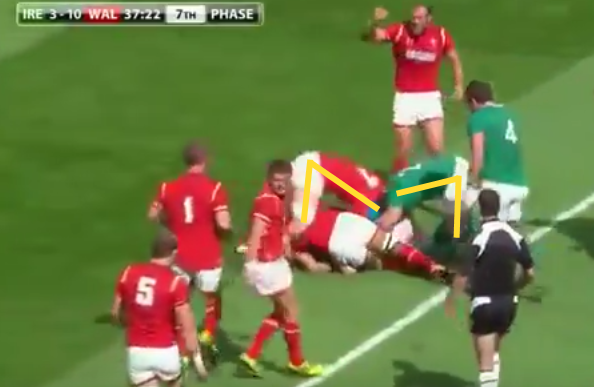 In an example of 1 on 1 work at the breakdown, let’s look at Ireland attacking into the Welsh 22. Jamie Heaslip has been tackled by Faletau and Tipuric arrives in support in a 1 on 1 with Richardt Strauss (Iain Henderson and Paul O’Connell not far behind him). From the still above it should be a fairly even contest for securing the ball. However…. Tipuric gets a much better body position going into the ruck. He has a far better angle on himself than Strauss, leading him to easily get head and shoulders under Strauss. Once this happened Strauss never stood a chance. In a moment support has arrived, but the Irish help only compounds the problem by also going after the ball, when they should have gone for Tipuric. This ended any momentum Ireland had for the play. Penalty Wales. Ireland were continually bamboozled by Tipuric at the breakdown. He punished them for every millisecond they were slow to a ruck. Here he gets in another perfect body position over O’Connell, and Murray is no match him. He tries to go high and bring him down from a bind on his body rather than his legs. That gives Tipuric just enough time to jackal the ball. By the time McGrath arrives it’s too late (McGrath’s ineffective entry didn’t help matters either). Tipuric had hands on the ball. One movement later: turnover Wales shortly followed by penalty Wales when Ireland try and illegally reclaim. One of my personal favourites was Tipuric taking everyone to school on the breakdown. Above we can see Tipuric coming in to assist the tackled player. He’s the perfect assist here in that he doesn’t commit himself fully, and stays on his feet. Because he hasn’t fully committed to the tackle, he can immediately compete at the breakdown, and when he does, he does it perfectly. He gets beyond the tackled player and the tackler, getting into the perfect body position. McGrath coming in for Ireland never stood a chance at competing for that ball which ensures a quick recycle for Wales. Never wavering in defence, Tipuric fought to the last in what seemed like unrelenting Irish pressure that was going to inevitably end in a try. But not while Tipuric was still on the pitch. Diving into the ruck, he goes after a ball he barely had right to even see, let alone poach. 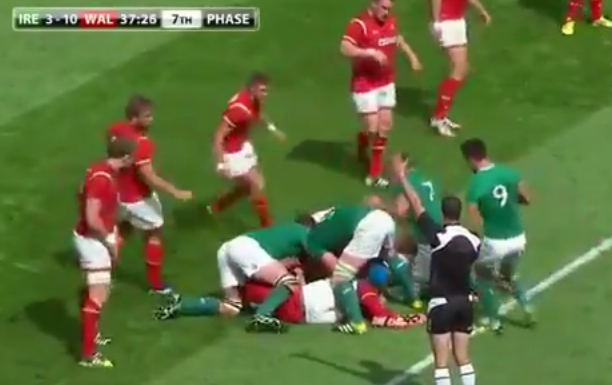 He gets one hand on the ball and lets the Irish forwards clearing him out do the rest of his job for him. While Tipuric carrying the ball over the line should have awarded Ireland the 5 meter scrum, it was opportunity gone for Ireland for what could have been a match winning try. Just like every good 7, Tipuric was at times on the edge of legality. Here he dances along that line with the same awareness as in his block that put Williams through. We can see he enters the ruck through the gate, but immediately step around the side, and before Jubert has time to even question the finer details of what he’s just done, McGrath is on his back, and Rhys Webb has shipped on the ball with near uncontested access. 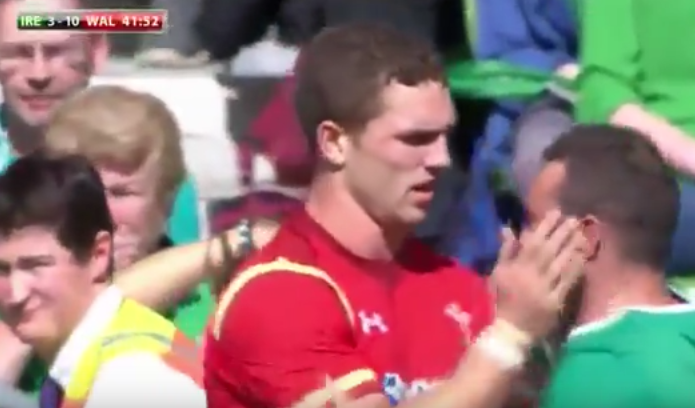 But the real story of the day was the lovely moment shared between George North and Dave Kearney.